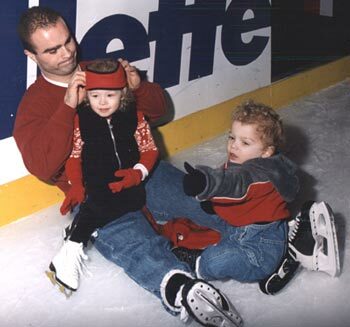 Tie Domi is a pro athlete who understands the privilege of being a star. He may be a tough guy on the ice but off the ice Tie definitely shows his softer side. He may take on every tough guy the opposition has but also generously contributes his time and money to charities. Tie is a father who spends as much time with his family as possible. Tie was born in Windsor, Ontario on November 1, 1969. Born to parents who immigrated from Albania. Tie’s first sporting loves were soccer and baseball. He did not play organized hockey until he was 10 years old. Tie went on to play for the 1984/85 Belle River Canadiens Junior “C” team (see photo below). Tie is the 4th player from the right in the second row. The next season Tie played for the Windsor Bulldogs where he lead the league inpenalty minutes with 346. Tie then split the 1986/87 season between the Peterborough Roadrunners and the Peterborough Petes. Tie played 3 seasons for the Petes where he helped the team reach the Memorial Cup in 1988/89. In 5 Memorial Cup games Tie scored 2 goals and lead the tournament with 26 penalty minutes. Tie was drafted by the Toronto Maple Leafs in the 2nd round of the 1988 entry draft. Tie played only 2 games for the Leafs in 1989/90 before being traded to the New York Rangers. Tie spent parts of 3 season with the Rangers including scoring his first NHL goal March 23, 1991 against Philadelphia. On December 28, 1992 Tie was traded to the Winnipeg Jets. Tie spent 2 1/2 seasons with the Jets. Tie was selected the Jets most popular popular player in 1994. April 7, 1995 Tie was traded back to the Toronto Maple Leafs. He was back with the Maple Leafs to stay. 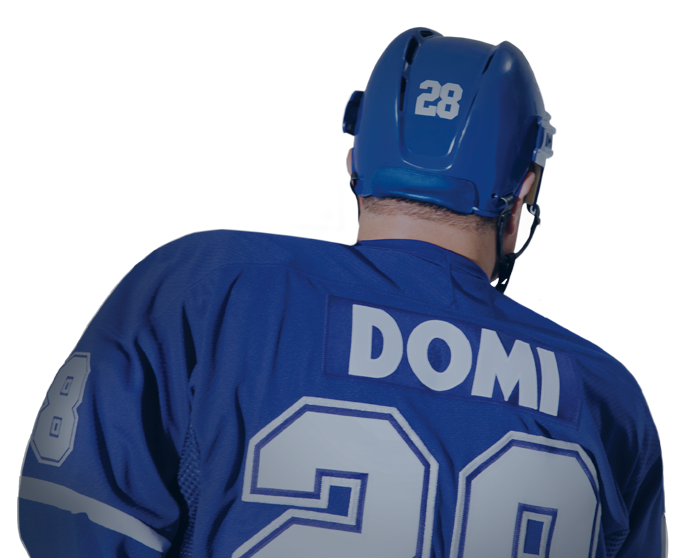 Tie is the all-time leading PIM leader for the Leafs surpassing his childhood hero Dave “Tiger” Williams on December 15, 2001. Tie has 3 children Carlin, Max and Avery Rose. Tie lives year round in Toronto. His summers are spent doing charity work, spending time with the family, staying in shape and golfing. Tie has always enjoyed sports. He did not start playing organized hockey until he was 10 years old. Tie’s favourite sports as a youngster were soccer and baseball. Tie was scouted by the University of Michigan for soccer and football while in high school. Played in the Toronto-based Canadian International Soccer League for Kosova during the 1995 off-season. Tie has kicked extra points and field goals for the Toronto Argonaunts in 2 exhibition games. Here Tie is with current Argos head coach Mike “Pinball” Clemons. Tie is an avid golfer who enjoys a round anytime.